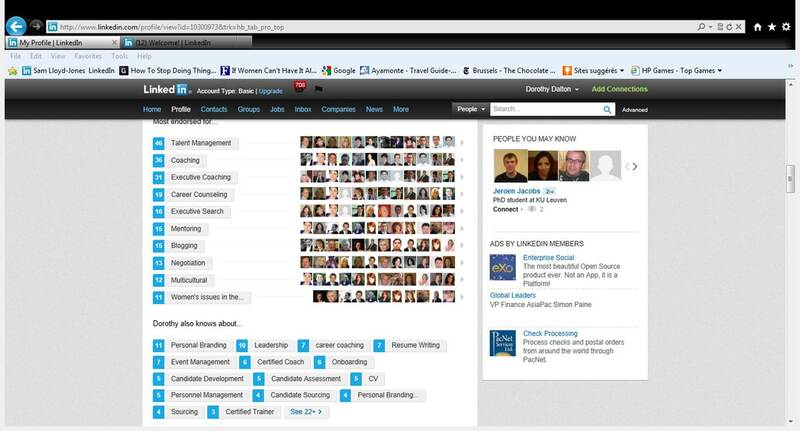 This entry was posted in LinkedIn and tagged Career Coach Brussels, digital footprint, LinkedIn, LinkedIn endorselents. Bookmark the permalink. Correct – a 358 maybe??? This is why we’re bloggers and not skateboarders! I’m with you on this. I will only endorse those who I know and expect the same. However, there is nothing like a written recommendation from a respected colleague or business associate. Great thoughts! I also think that the things that are most recommended can point to the things that the person is truly capable of. You can also cross reference the recommendations with other items on the LinkedIn profile: career history, education, written recommendations, etc. I have also been careful with who I recommend and for what capability, it reflects on my character and judgement. Hi Andrew – how are you? Hope all is well. I agree. We devalue our recommendation currency if we are indiscriminate. I also use the tool sparingly and appropriately. Worth it in the long run I think. Thanks for your comment. Hello Dorothy. I am doing quite well. Now that the MBA/MS is behind me I am looking forward to the next chapter. I often think of the workshop that we had with you in Paris. Thank you for everything! Those were the days! My Paris MBA “season” finished last week for the new cohort! I went through similar process. From denial to acceptance, and I still don’t like to be endorsed by someone who is not familiar with my expertise. Hi Dijana… agreed. But we do have the option not to display any recommendation from someone we don’t know. Dorothy – your thought process mirrors mine – was initially uncertain of the value, now I can see a few benefits. The sticking point to me is that not everyone will use the common sense that is requisite in any social media interaction. So, we will still need to suffer the random “endorsement” in an area that doesn’t make any sense. Great post – thanks for a thorough and thoughtful analysis of this “quick hit” social media feature. Hi Jennifer – I agree – so for me the key is to be true to ourselves so our endorsements will be valued. I hope! Thanks for your comment. Thanks for sharing your journey on this. I’ve come to feel it’s more useful to make the best we can of LinkedIn’s changes than to rail against them, and we do have the capacity to manage this one, as you make so clear. Thanks Dan – the system can be abused of course but when used with integrity it does add value. Hi, I think when used properly the endorsements do make sense but it often feels more like a popularity contest. Thank you- appreciate your kind words! Re-blogged Dorothy, I think it does make search for the right person easier, and then they can look through their recommendations to back up the statistical data from endorsements. Hi Simon – thanks for your comment. I keep coming back to the same comment – used sensibly it’s fine. Used with no sense – the process becomes nonsense! Thanks Kaarina – yes it’s probably a big ask for that to happen but it should be a starting point for everyone! It’s the abuse that de-values the standard.